Forest is a primary biome type characterized by mild temperature with many trees growing closely together. Forest planets are a 'moderate' threat level, geared toward tier 2 in progression. There will always be a a forest planet inside a new character's starting solar system, so all players have the option of traveling there after leaving the garden starter world. Forest biomes can be created and expanded using a Wooded Terraformer, and a planet will convert to a Forest planet once half of the planet's surface has been terraformed into Forest biome. Forest planets can be found orbiting gentle (white), temperate (orange) and radioactive (yellow) star types. They also have a rare chance of being found around frozen (blue) stars as satellites of gas giants. There are no environmental hazards in forest biomes which require use of an environmental protection pack. Possible mini biomes inside forests are spring, characterized by flowers, and mushroom patch which has large mushroom trees, alpine, swamp, and giant flower. Batongs, Bobfaes, Crustoises, Crutters, Peblits, Scaverans, Snaunts and Spookits have a chance of being found in forest biomes. 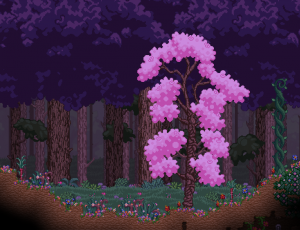 Forests are the most common planet to find Floran villages and dungeons, they are found there more than any other planet type. Densely colonized by trees and other flora, this forest landing site is a hospitable location that supports a diversity of life - potentially including your own. Leafy trees abound in this forest location. The area is hospitable to life. My database indicates that you may encounter woodland creatures. Your beam site for this planet is located in a forest. Readings indicate that this wooded area is relatively tranquil. The surface layer of forests is primarily made up of cobblestone and dirt. There's an abundance of gatherable wood because of the plentiful trees. The planet's primary color in the navigation console and while orbiting above is the primary color of the dirt found there. Most common early game ores are found in forest biomes, with of copper, silver ore, gold, iron and tungsten available near the surface. The surface of the ground is mostly covered in grass, and the topography is often hilly with small subterranean caves. On the surface and inside caves there are frequently small pools of water. Forest biomes use the Day Tracks during the day and the Night Tracks during the night. Brightly colored trees are often found in spring mini biomes. There are sub biomes which can be found on forest planets in addition to their unique mini biomes. Garden or jungle have a chance to appear as smaller biomes on forest planets. These biomes will include things like their associated blocks, trees, and crops when they appear. Mini biomes for each of these secondary biome types can appear inside them as well. Forests can also be found on a number of different planet types as sub biomes. They have a chance of being found as sub biomes on garden, savannah, snow, jungle, mutated, midnight, and volcanic planets. Alpine, Giant Flower , Mushroom Patch, Spring, and Swamp are mini biomes found inside forest biomes. These mini biomes can be found on forest planets or inside forest sub biomes on other planet types. These mini biomes each have their own creatures and items outside what's available in forest biomes. Alpine - Cold, grassy cliffs. Sometimes home to Alpaca. Giant Flower - Towering flowers the size of trees grow here, they can be harvested for petals. Mushroom Patch - Has large towering mushrooms in place of trees. Spring - Characterized by colorful flowers which replace normal grass. Swamp - Murky water and trees characterize this wet mini biome. Froggs can be found living here. Forest planets stick to the standards for planetary layer composition. There are a variety of harvestable crops found in each biome. These can be harvested by interacting with them or by digging them up. They'll drop produce and have a chance to drop a seed which can be replanted. In addition to procedurally generated creatures, there are a variety of unique monsters, bugs and critters found in forest biomes. Some of these are also found in other biomes, while others are unique only to forest biomes. While these unique creatures have a chance to appear on forest planets, they will not all appear on each one. In addition to unique creatures, each biome has multiple types of both procedural ground and flying creatures. Unique monsters each have combat attacks, and they must first be weakened before capture. Once weakened players can attempt to capture using a capture pod. If successful they can then be released to battle alongside and follow the player. Critters are smaller non-combat unique creatures which are not capturable using capture pods. They can be captured without weakening them first by using a relocator gun. After releasing a critter from the relocator it will stay in the area it was released into. Bugs are very small unique creatures which can be captured using a bug net, and are then stored inside placeable jars. Bugs which are captured using a relocator will fly after release instead of being kept inside a jar. There are a variety of items which are specific to chests found in forest biomes. Some of these may have a chance of being found in other places throughout the universe, but they've all been specifically allocated to chests within forest biomes. Chests in forests also commonly contain flares and climbing rope. Forests can have a large variety of settlement types found on them. These include small microdungeons and NPC camps, larger racial villages and hostile dungeons. Smaller forest planets usually contain only one dungeon or village, while larger forest planets can contain as many as three. Forests are the most common planet to find Floran villages and dungeons, they are found there more than any other planet type. This page was last modified on 17 December 2018, at 14:52.